Get the book David Barton doesn’t want you to see. Now get it cheaper. 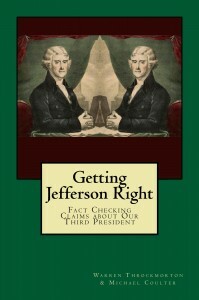 Until early next week, I am lowering the price of the Getting Jefferson Right in paperback to $9.95 (23% off) and the Kindle version to $3.99 (20% off). It will take awhile for the Kindle price to change on Amazon but you can get the lower price on the paperback from our CreateSpace site now. Just click the link for CreateSpace. The book is a must for anyone on your gift list who knows about the David Barton controversy, has read The Jefferson Lies, or who like Thomas Jefferson and/or American history. To read reviews of the book, go on over to GettingJeffersonRight.com. To like the book on Facebook, click here. To get the paperback, go to the book’s CreateSpace page.